In the same way, one can measure objectively whether Transcendental Meditation practitioners are effectively becoming younger and by how much. 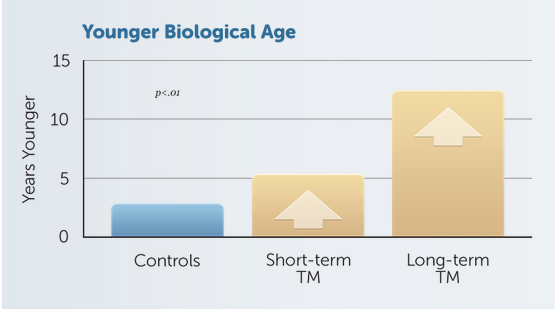 A study with 84 subjects showed that TM practitioners who have practiced the technique for 2.9 years on average, are 5 years biologically younger than the norm. Long term practitioners, who, on average, were using the Transcendental Meditation technique for 7.1 years, were biologically even 12 years younger than their chronological age would predict. Reference:International Journal of Neuroscience 16: 53–58, 1982. Join us for a FREE INTRO TALK this Wednesday at 18.30 to find out more.